Hi, friends! Well, I am back with one more of my wreaths. I shared in my last post that I have made 3 wreaths for spring and Easter. Here is wreath #2 that I made for my classroom. I found the adorable little bunny face at the dollar store and decided he needed a body to go along with that cute little face. Yes, I have been back to The Dollar Tree, and found lots of fun things to decorate with as always! I am on a mission this spring to try my best to use up some of the many crafting supplies I have in 2 of my craft closets. I definitely got my love for crafting and creating from my sweet grandmother. I ended up with boxes full of crafting supplies that she had in her closets. I also ended up with both of my grandmother's sewing machines, and I am very sad to say I have yet to open those up and get busy sewing. It is on my never-ending to do list though. We used to make those macrame hanging plant holders. I learned how to do that at Girl Scout Camp and I taught her that one. Precious memories! I know I am being very sentimental, because we lost her exactly one year ago this week. She would be thrilled to know I am putting all of things to good use. Back to this little bunny wreath! 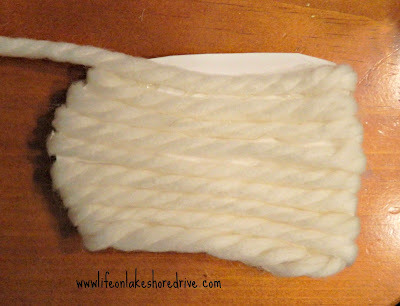 I love this yarn because it is wide and fluffy! I decided to use this to make the body of the bunny, and I did it the same way that I made my blue wreath. I used a pool noodle and placed a wire hanger inside the noodle, except I gave this one more of an oval shape. I didn't do another tutorial for that, but you can see that post here if you missed it. Because the yarn is so much larger, this one really did not take long to wrap at all. Once I had it all wrapped up, I cut out the arms and feet patterns from poster board. Here is what I used for the feet. I thought I had taken photos of the arms, but I couldn't find them in my massive photo collection. Another project on my to do list.....organize photos! 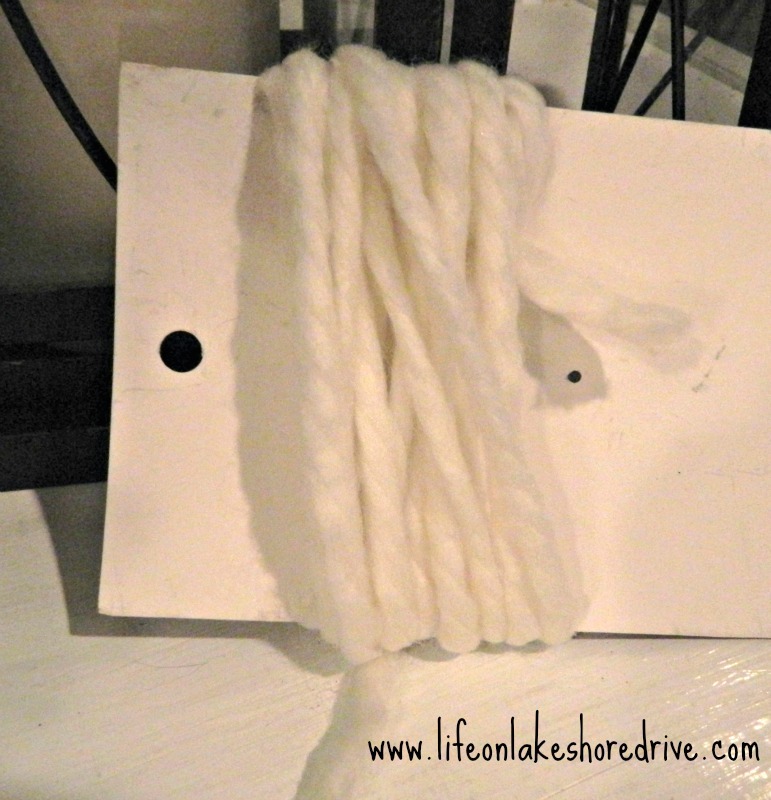 I used my glue gun to glue the yarn onto the poster board. I wrapped the yarn just like I did the noodle. 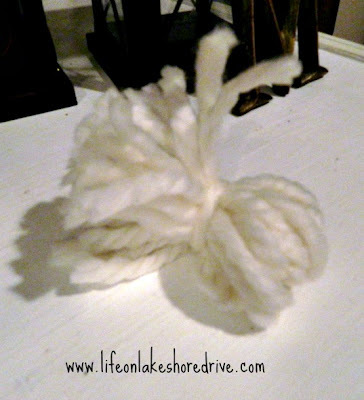 To make the cute little cotton tail, I wrapped the yarn around a piece of cardboard. I slid the yarn off, and tied the middle of it with a piece of the yarn. Then I cut the ends and fluffed up the pieces. 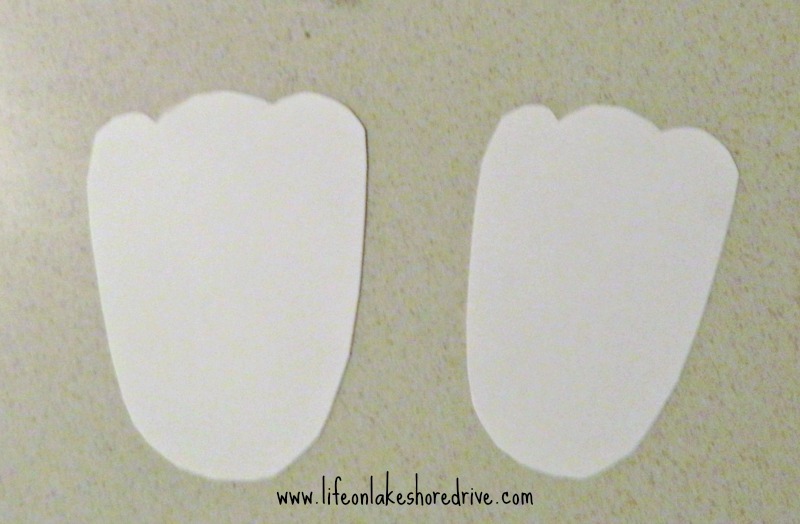 I cut some pink little pads for the bottom of the bunny feet. I used floral pins to attach all of the pieces to the wreath. I also found those adorable carrot eggs at the dollar store! I loved them so much, they were one of the reasons that I wanted to make this wreath. I did use the glue gun to glue the eggs to a piece of twine, and then glued the twine to the paws. I debated on wrapping the bunnies face in the yarn so it would match the rest of the body, but decided I had enough time invested in it. That would be an option if you wanted to take this wreath one step further. Another variation would be to add a basket with spring flowers in it, instead of adding the carrots. Thank you so much for stopping by to see my little Easter bunny! I will save the third wreath for awhile, and share some of my spring decor in the next few posts. I hope you are having a great week!! Well this is just the cutest darn thing EVER! This wreath is darling, Kathy. I love how you made a body for it. 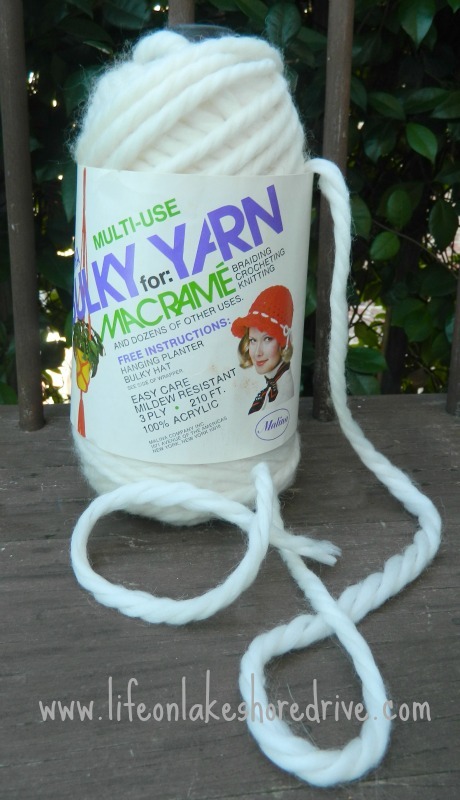 What makes it even more special is that you used your Grandmother's yarn for it. What a creative project. Have a happy week. That is one of the top cutest wreaths I have ever seen! It's just adorable. And I like how you used your grandmother's yarn! It makes it mean that much more! This is as cute as can be! You are so creative, as always! Your mom is smiling down on you loving every moment! I'm in love with this cute bunny !! This is so cute!!! !..I'm tempted to make one now that you've posted a tutorial, but I have to ask the little man first...he tends to get a little freaked out by big faces of all kinds...I love it though! It's great having sweet memories of your Grandmother. Mine was my most favorite and special person in the world to me while I was growing up. So, so, so cute Kathy!!!! So cute and clever. Thank you for sharing at Memories by the Mile. Pinning it. See you next week. My Grandmother was so special to me, she passed away in 2010. I love your Bunny! he is so cute!! How adorable is that?! I love it Kathy. Awwww I want one. lol Have a great rest of the week. That is so freaking cute!! I love remaking things from the dollar store to be super cute things. Stopping by from Adorned From Above Blog Hop. Alexis from Running Away? I'll Help You Pack! Kathy, this is so fun! 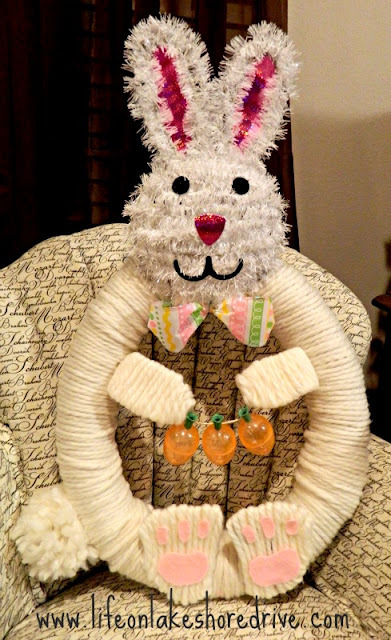 I've never seen a bunny wreath made like this...very clever! I'd love for you to share this at my March Madness Party. This is so cute! I've never thought of making a wreath for Easter. My kids would love it too. 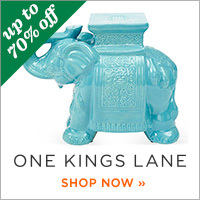 Each week I host a link party at my site (www.easylivingmom.com) - it starts on Thursdays and goes all week. I would love it if you would be able to join and share this! Have a great day! That is the cutest thing ever. Thank you so much for the tutorial. I am one of your new followers. This is so adorable...cute as can be. This is too adorable, Kathy! Thanks so much for sharing the great tutorial! This is adorable! 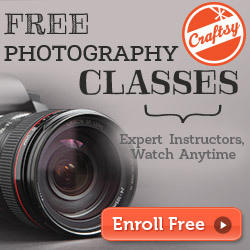 I love crafting and I'm so excited to be your newest follower. I'd love a visit from you whenever you have the time. So cute! So fun! Thank you for linking this up to Rustic Restorations Weekend! Time to shine! 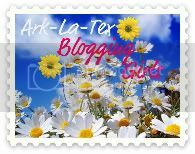 Share your favorite post of the week at Friday Flash Blog Hop with The Jenny Evolution! Visit http://www.thejennyevolution.com. 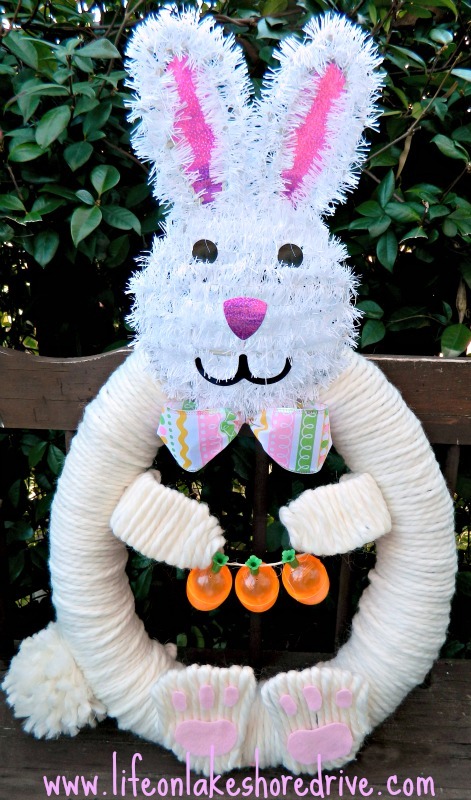 You Easter Bunny wreath is soooooo cute!!! I love it! Thanks for sharing @ Submarine Sunday! You did a great job with yours. I'm visiting today from the Raising Imperfection hop. Such a cute little bunny! Hi Kathy... Wanted to let you know you were featured at One More Time...you really know how to put a wreath together...love them all. What an adorable idea, I love the dollar store!! Cute bunny wreath Kathy! I'm sure your class will love it. I'm sorry for the loss of your grandmother. I lost mine a little over two years ago. So glad you will have these things you've made from her stash to remember her by. Thank you for sharing it at What We Accomplished Wednesdays. Have a great weekend! Oh my goodness!! It's just so ADORABLE!! 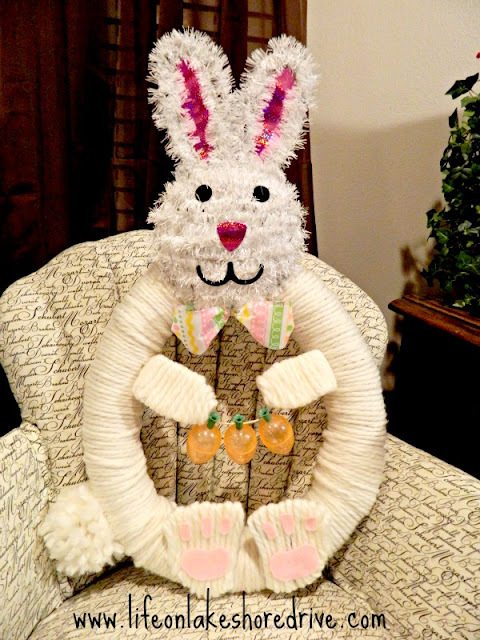 Kathy I'm so proud to be featuring your bunny wreath this week on Transformed Tuesday. Have a great week. Grandmothers are special people! They would absolutely love to hang one of your wreaths on their door! You are so creative! My nephew loves this wreath! He wants me to make him one! I love to see Easter decorations and an Easter bunny is always one of my favourites. This wreath is absolutely beautiful. 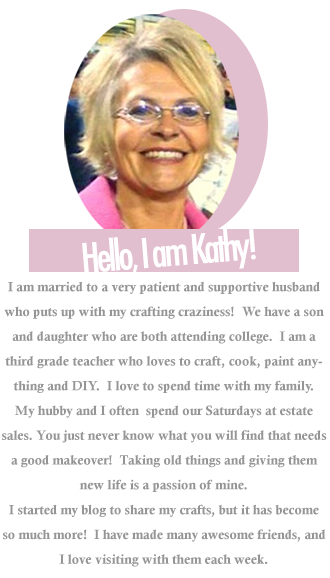 Thanks for sharing on Creative Monday Kathy. Such a cute wreath ~ and I love that it has more character than a traditional round wreath! Thank you for linking up at Fluster's Creative Muster. Hope to see you next week! This is absolutely adorable! I love the feet! Your bunny wreath is so cute. Love the little feet too. Thanks for sharing on Thursdays Treasures. Hippity Hoppity Easter is on it's way! Thanks for sharing with SYC. Kathy, he is so cute! I love his face, it gives a nice contrast to the body. He may have been a lot of work, but your adorable wreath is so worth it! Love it! super cute! I especially love how you added the feet :) Thanks for sharing at The Weekly Creative. This is such a cute wreath! It's so lovely that you are using your grandmothers's crafting supplies. I am sure she is smiling down on you. Thanks for linking this up to Saturday Sparks. It looks super adorable! So creative! 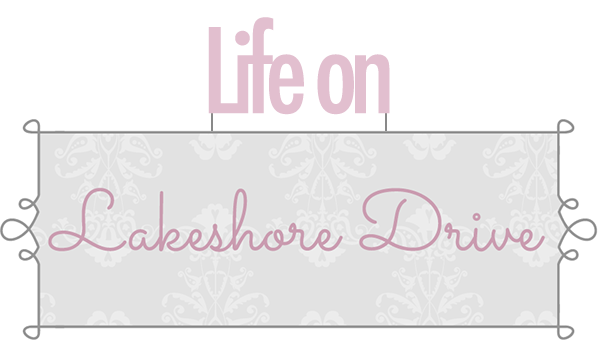 By the way, I’m hosting a Link-Up party and would be thrilled if you decided to participate!!! I looove this, so cute! Pinning it! Thanks for linking up at Motivating Monday at CEO of Me this week! Oh wow, this is fun!!!! We love your projects! Thank you so much for linking up in our Crafty Showcase! You are always so inspiring! How adorable! Thanks for sharing!! This bunny is SO cute! Thanks for linking up @ The Patriotic Pam this weekend. 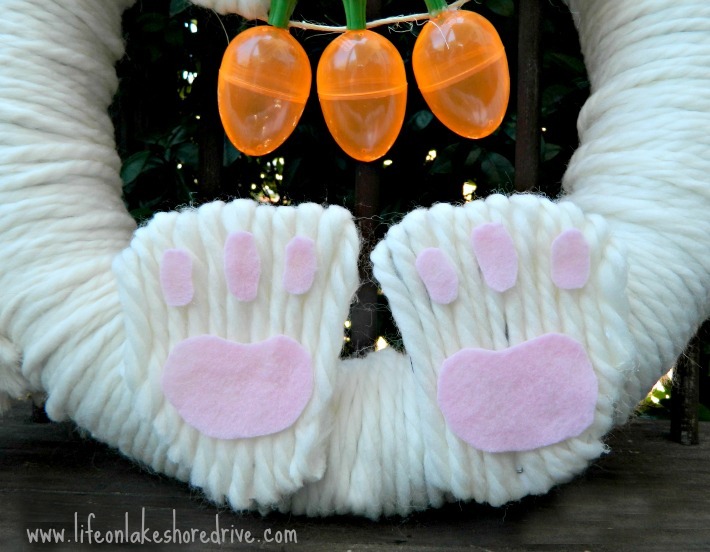 Love the bunny wreath...clever idea! I pinned it to my Easter board. Thanks for sharing it at the Rock N Share! I am your newest follower (GFC).